People without broadband at home can face substantial challenges navigating key life events, with difficulties looking for work or applying for a job among the most prominent. Despite a number of state and federal initiatives promoting increased broadband adoption, a significant share of U.S. adults (33%) say that they still do not subscribe to high-speed internet service. Pew Research Center surveys have found that Americans view trouble in finding work or advancing one’s career as the most significant impediment facing those without broadband. 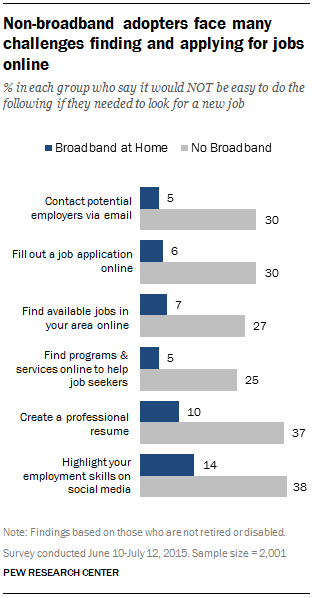 Some 52% of Americans believe that those without broadband service at home are at a “major disadvantage” when it comes to finding out about job opportunities or gaining new career skills. Non-broadband adopters can also face substantial challenges engaging in a number of digital job-seeking activities. For instance, 37% of non-broadband adopters indicate that it would not be easy for them to create a professional resume if they needed to do so; 30% would find it difficult to contact an employer via email, or fill out an online job application; and 27% would have a hard time finding online lists of available jobs in their area. In each case, those with broadband access at home express a much greater comfort level accomplishing these tasks. These gaps are especially notable considering online employment resources now rival personal and professional networks as a top source of job information for Americans looking for work. While cost is the primary barrier facing non-broadband adopters, some also say they are satisfied with the online access provided by their smartphones — 13% of Americans are now “smartphone only” (meaning they have a smartphone but lack traditional broadband service at home). And nearly one-third of these “smartphone only” users say that the main reason they don’t have broadband at home is because their smartphone can do everything they wish to do online. Yet those who rely on mobile devices for online access face job-seeking challenges, ranging from data caps on a smartphone plan to attempting to craft a resume or apply for a job on a device that was not built for extensive text entry. One-quarter of “smartphone only” users have used a smartphone to fill out a job application online, and 13% have used a smartphone to create a resume or cover letter. These disparities in access could become a self-perpetuating cycle for financially struggling Americans. If this group continues to give up (or not purchase) broadband service for economic reasons, they may run the risk of losing out on potential future employment opportunities simply because they don’t have access to the appropriate tools for the task.